The interaction of light with matter is the basis of spectroscopy, a set of techniques lying at the heart of physics and chemistry. From infrared light to X-rays, a broad sweep of wavelengths is used to stimulate vibrations, electron transitions, and other processes, thus probing the world of atoms and molecules. However, one lesser-used form of light is the terahertz (THz) region. Lying on the electromagnetic spectrum between infrared and microwaves, THz radiation does have the right frequency (around 10^12 Hz) to excite molecular vibrations. Unfortunately, its long wavelength (hundreds of micrometers) is around 100,000 times a typical molecular size, making it impossible to focus THz beams onto a single molecule by conventional optics. Only large ensembles of molecules can be studied. Recently, a team led by The University of Tokyo's Institute of Industrial Science (IIS) found a way around this problem. 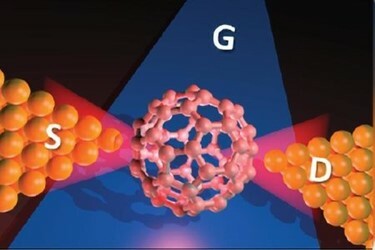 In a study in Nature Photonics, they showed that THz radiation can indeed detect the motion of individual molecules, overcoming the classical diffraction limit for focusing light beams. In fact, the method was sensitive enough to measure the tunneling of a single electron. The IIS team showcased a nanoscale design known as a single-molecule transistor. Two adjacent metal electrodes, the source and the drain of the transistor, are placed on a thin silicon wafer in a "bowtie" shape. Then, single molecules--in this case C60, aka fullerene--are deposited in the sub-nanometer gaps between the source and drain. The electrodes act as antennas to tightly focus the THz beam onto the isolated fullerenes. "The fullerenes absorb the focused THz radiation, making them oscillate around their center-of-mass," explains study first-author Shaoqing Du. "The ultrafast molecular oscillation raises the electric current in the transistor, on top of its inherent conductivity." Although this current change is minuscule--on the order of femto-amps (fA)--it can be precisely measured with the same electrodes used to trap the molecules. In this way, two vibrational peaks at around 0.5 and 1 THz were plotted. In fact, the measurement is sensitive enough to measure a slight splitting of the absorption peaks, caused by adding or subtracting only one electron. When C60 oscillates on a metal surface, its vibrational quantum (vibron) can be absorbed by an electron in the metal electrode. Thus stimulated, the electron tunnels into the C60 molecule. The resulting negatively charged C60− molecule vibrates at a slightly lower frequency than neutral C60, thus absorbing a different frequency of THz radiation. Apart from providing a glimpse of tunneling, the study demonstrates a practical method to obtain electronic and vibronic information on molecules that only weakly absorb THz photons. This could open up the wider use of THz spectroscopy, an under-developed method that is complementary to visible-light and X-ray spectroscopy, and highly relevant to nanoelectronics and quantum computing.